#6 BRIDAL ZIPPERS - 20"
Home > INVISIBLE ZIPPERS > #6 BRIDAL ZIPPERS - 20"
In the picture above for size comparison, #4 zippers on mesh are at the top & #6 invisibles on twill are on the bottom. White on the left, ivory on the right. Vera Wang uses this #6 weight invisible zippers in her wedding gowns for extra security. Invisible zippers are available in #2 (what you get in the store), #4 & #6. The number is the size of the coil when it is closed so #2 would be approximately 2mm across when closed. #4 in 4mm across when closed. #6 is 6mm across when it is closed. 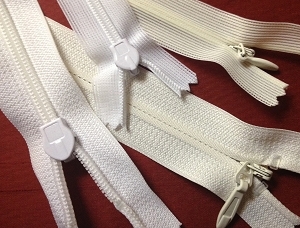 #2 & #4 invisible zippers are available on knitted or mesh tape as well as twill tape. The knitted tape makes the zipper more flexible, not more or less strong. #6 invisible not available on mesh tape, only twill. #6 BLUSH Invisible - 22" & 28"